A year prior to the 2010 AHAR release, the U.S. Interagency Council on Homelessness (USICH) released the nations first comprehensive strategy to prevent and end homelessness, Opening Doors: The Federal Strategic Plan to Prevent and End Homelessness.The plan sets an ambitious agenda for addressing homelessness, stresses governmental collaboration at all levels, and encourages using programs targeted to homeless families (as well as other homeless subpopulations) and mainstream resources to help families achieve housing stability. The growing concern about family homelessness has renewed the focus among policymakers, researchers, advocates, and practitioners on the use of mainstream programs to prevent and end homelessness. The underlying belief is that programs explicitly for homeless people cannot be expected to do the whole job of preventing and ending family homelessness. Indeed, ever since the start of specialized federal funding for homeless people,[iii] it has been recognized that mainstream programs such as Housing Choice Vouchers (HCV) and Temporary Assistance for Needy Families (TANF) provide much greater resources than targeted programs for helping families leave homelessness. It is within this context that the Office of the Assistant Secretary for Planning and Evaluation in the U.S. Department of Health and Human Services (HHS) commissioned a study that focuses on local programs that link human services with housing supports to prevent and end family homelessness. (The Department is also engaged in a similar study that focuses on homeless individuals.) The primary goal of the study is to identify promising practices that facilitated the development, implementation, and sustainability of these programs. Creating a logical program structure with services tied directly to goals. The programs in the study developed structures with: a) objectives that were within reach of the target population, b) service interventions that were tailored to the target population, and c) partners that were best suited to provide those services. Developing lasting partnerships. Programs that laid a solid foundation for future collaborations were built on three pillars: a) program missions that advanced the goals of each partner, b) deliberate coordination processes that fostered accountability, and c) capitalizing on established collaborative environments. Utilizing nontraditional community resources. The constellation of partners went beyond the traditional network of social service providers and government agencies, demonstrating that thinking creatively when looking for partners can add value to the service interventions. Forging relationships between program staff and local landlords to increase housing options. The relationships among case managers, housing specialists, and local landlords were designed to be mutually beneficial: case managers and housing specialists were able to place homeless families into decent affordable housing, and landlords were reassured by the ongoing program support offered to tenants and by the promise of a stable source of rent. Using case managers to link human services and housing supports. Case managers served as the focal point for linking services and housing supports, and the strongest linkages were created intentionally by staff, informed by a thorough assessment of client needs, and intensive meeting purposefully and frequently. Tapping a breadth of funding sources. Communities used a diverse patchwork of funding streams to support their programs, and most had a decentralized funding model in which each organization used its own funding resources to participate in the program. Using standardized intake and assessment forms and data-sharing systems to improve program operations. Many programs used standardized client intake and assessment tools which streamlined program operations, eliminated duplicative assessments, improved service delivery, and provided common metrics for gauging progress. Developing a continuum of housing that uses locally funded housing supports as a gateway to federal supports. Several programs in the study partnered with their local public housing agency to develop a continuum of housing that provided temporary or transitional housing assistance to homeless families with integrated case management services until the families transitioned to a permanent housing opportunity e.g., HUDs HCV program or public housing developments. Streamlining the PHA lease-up process (i.e., identifying, inspecting, and renting an appropriate housing unit) through a review and retooling of PHA administrative procedures and using program partners for some housing functions. The most common strategy was to utilize program partners, most often case managers, to assist with program applications, housing search, and unit inspection activities. Creating supportive housing environments by integrating intensive case management and services with mainstream housing supports, allowing mainstream housing programs to be used by families with high barriers to housing. The housing subsidy was typically a tenant- or project-based voucher, public housing, or tax credit unit, and the services were supported by intensive, structured case management. These practices appear to have facilitated the development, implementation and sustainability of the programs. However, the study did not include a research design that allowed assessment of the effects of these practices on client outcomes, and thus the study is unable to address whether these practices contribute to the goal of preventing and ending family homelessness. Collaborative: The program brings a true integration of human services and housing supports to offer a coordinated package of services to homeless families. Implementable: The program is relatively easy to implement and can be sustained over time. Replicable: The program can be applied in communities of different sizes and geographies such as large urban cities, mid-sized cities or suburbs, and small towns in rural settings. Measurable: The program is evidence-based and measures the outcomes associated with participating family members. Cost effective: The program results in the efficient use of resources. 6. Palm Beach, FL Adopt-A-Family of the Palm Beaches, Inc.
Over 80 programs were considered for the study, and 14 were approved in consultation with a Technical Working Group composed of representatives from HHS, HUD, USICH and the Department of Education. Among the 14 programs, seven had explicit partnerships with the local PHA to serve homeless families. These programs were selected to demonstrate how communities partner with PHAs to provide mainstream housing assistance such as HCV and public housing to prevent and end homelessness among families. The next two sections describe each of these promising practices in turn, beginning with the seven practices that apply to all 14 programs followed by the three practices that are specific to PHA programs. For each promising practice, the sections provide: 1) an overview that describes how the practice facilitated the development, implementation and sustainability of the programs, and 2) two specific examples from the communities that participated in the study. 1. Programs closely tied their overall objectives to their target population, service interventions, and partnership arrangements, resulting in more focused programs. The objective is appropriate and within reach of the target population. The objective of some programs was to rapidly re-house homeless families and transition them into market-rate housing that they paid for themselves within a short period of time. Recognizing that this objective would not be reasonable for chronically homeless families with multiple barriers to housing, these programs fittingly focused on families who suffered from a short-term economic crisis and had some income (or potential for income) to support their housing expenses. Several programs opted to focus on a few key objectives rather than a long list of goals, and this resulted in a more focused program with greater follow-through in linking program participants to services. The service interventions are tailored to the target population to make it more likely to achieve the objectives of the program. Programs that targeted the hardest to serve for example, chronically homeless families that may be socially isolated and have fallen out of the broader social service network tended to use a Housing First approach. This approach placed families into permanent housing before resolving the underlying issues that may have led to their homelessness. For example, the Housing First approach does not require clients to be clean and sober or seek treatment in exchange for housing, recognizing that the hardest-to-serve population may be service-resistant and willing to remain homeless if compelled into treatment. The service intervention made it more likely to achieve the immediate goal of ending episodes of homelessness among families and allowed program partners to focus on the long-term goal of keeping families in their housing. The program partners agree with the objectives of the program and can provide the appropriate service interventions. Programs in the study selected partners that shared a common vision for the program, and the programs objectives aligned with the missions of each individual organization. Program partners were selected to provide the appropriate constellation of service interventions, as dictated by the target population and program objectives. For example, rapid re-housing programs that targeted families who suffered from a short-term economic crisis typically partnered with local emergency shelters as the primary referral source, with job readiness and employment training organizations to reconnect families to a source of stable incomes, and with landlords to offer affordable housing options. Family Assertive Community Treatment (FACT) Program in Chicago, IL: The objective of the FACT program is to assist young mothers and their children in stabilizing and improving their housing, employment, family well-being, and health status. The FACT program targets homeless and at-risk families with severe mental health issues and uses a modified Assertive Community Treatment (ACT) model and medium- or long-term housing subsidies. ACT models were first developed in the late 1960s and use a team treatment approach to provide comprehensive, community-based treatment, rehabilitation, and support to persons with serious mental illness. The FACT program has a systems integration manager, who periodically attends FACT team meetings and convenes a planning coalition comprised of organizations that can affect systems and community change. The FACT planning coalition members include consumers, members of the foundation community, and representatives from child development, housing, education, mental health, substance use, and vocational systems. The systems integration manager also coordinates the cross-training of staff in various social service fields. FACT team members believe that the systems integration work helps partners and service providers see the linkages between the objectives of the program and the different types of services and supports used by young homeless families, which in turn improves the provision of individual services. Adopt-A-Family (AAF) Rapid Re-Housing Program in Palm Beach, FL. The AAF program is designed to meet a very specific goal: to limit the use of expensive hotel/motel vouchers at a time when emergency shelters are over capacity by re-housing families within 30 days of becoming homeless and helping them remain stably housed and out of the shelter system. To accomplish this objective, the program assembled a small number of partners who provide services directly related to this objective: emergency shelters to provide referrals to the program; service providers to provide credit counseling, legal services, and job readiness and employment services; a childcare voucher provider to enable the adults in families to focus on their self-sufficiency goals; and housing providers to provide and manage the rental assistance. The program uses common client intake and assessment tools to develop tailored family action plans that identify barriers to, and strategies for, attaining independent housing. As such, the tools codify and advance the programs overall mission. 2. Programs produced lasting partnerships through common missions, purposeful coordination, and by capitalizing on established relationships. Programs that laid a solid foundation for future collaborations were built on three pillars: 1) program missions that advance the goals of each partner; 2) deliberate coordination processes that fostered accountability, and 3) capitalizing on established collaborative environments. In several communities, partner organizations were able to advance their own organizational missions, those of their partners, and the overall objective of the program simultaneously. While the varied goals of individual partners may have exceeded those of the program for example, individual partners may work with other vulnerable populations and have a different set of objectives for these populations the goals of the program advanced the overall mission of each partner agency, so that each had a stake in the program's success. For example, several programs in the study were designed to rapidly place homeless families into housing and help them become self-sufficient through temporary rental assistance, case management, and the provision of supportive services. Emergency shelters that served as referral sources for these programs were able to achieve their organizational missions by moving clients into housing, freeing up resources for other needy clients. Providers of employment and job training services promoted families long-term capacity to become self-sufficient and sustain their housing by improving their job search skills and placing them in jobs, thus achieving their organizational mission. In short, lasting partnerships were based on win-win arrangements. Partnerships were also built on deliberate efforts to coordinate across partners, which fostered a strong sense of accountability among partners and responsibility to clients. These efforts appeared in many forms: 1) regularly scheduled meetings between partner agencies to discuss specific client concerns and program operational issues; 2) memoranda of understanding that formalized the roles and responsibilities of each partner agency; 3) steering committees, oversight boards, and planning coalitions to oversee and monitor the programs progress and integrate systems; and 4) regional housing groups composed of elected officials and representatives from housing departments, public housing agencies, planning commissions, and community groups. These deliberate coordination efforts resulted in distinct roles and clear lines of responsibility among program partners and introduced transparency to the planning process, which in turn created a greater sense of trust among partner organizations. Lastly, while some programs created new partnerships, others capitalized on established relationships and used the program collaboration to further cement these relationships. Prior relationships often existed between public housing agencies and landlords; social service agencies and local departments of human services; and homelessness service providers and the local Continuum of Care. Several programs built on partnership arrangements that were first created by the Homelessness Prevention and Rapid Re-Housing Program (HPRP). Pathways to Housing Program in Brattleboro, VT. The goal of the Pathways to Housing program is to help homeless households and households at risk of homelessness find and maintain stable housing by linking temporary housing assistance (up to two years) with case management services. The program is based on formal agreements that foster mutual accountability: between service providers and the local PHA, between the housing authority and landlords, and between families and case managers. An Oversight Committee was created specifically for the Pathways to Housing program, comprised of individuals from the Agency of Human Services, the Department of Economic Security (TANF), the Brattleboro Housing Authority, the Department of Corrections, a large shelter, and a day shelter drop-in center. The committee reviews the applications, interviews applicants, decides who is accepted into the program, and monitors overall program policy. The committee meets monthly, and staff from individual partners (e.g., case managers) also meet regularly. The Linkages Program in the State of New Mexico. The Linkages Program emerged from the New Mexico Behavioral Health Purchasing Collaborative, a group of 13 partner organizations that pooled their health services resources from the state. The Collaborative contracts with a lead agency to act as the single statewide entity to provide mental and behavioral health services through local organizations. The New Mexico Mortgage Finance Agency oversees the housing component of the Linkages program. At each of its three locations in the state, the program relies on local organizations to function as supportive service agencies and housing administrator organizations. The supportive service agency is responsible for using the states existing Medicaid platform to provide case management, while the housing administrator assists families in locating and securing housing and transitions clients from the state-funded housing supports to the HCV program. A letter of agreement between the New Mexico Mortgage Finance Agency, the supportive service providers, and housing administrators delineates the responsibilities of each organization in the program. 3. Nontraditional organizations outside the usual social service network were valuable partners in helping to prevent and end family homelessness. The constellation of program partners went beyond the traditional network of social service providers and government agencies to include mortgage finance agencies, school district homeless liaisons, private housing developers, private businesses, faith-based institutions, and university personnel. Each non-traditional partner made important contributions. Some functioned as sources for referring clients to the program, while others were direct service providers, funders, or housing developers and managers. In a few communities Decatur (GA), Portland (OR), and Washington (DC) the school district liaison played an important role in monitoring the educational outcomes of children served by the program, including their attendance, behavior, and grades. The school liaisons worked on a regular basis with the case managers assigned to the families by the program. Another nontraditional partner in the provision of homeless services, a private housing developer in Lawrence, MA, played the central role in a housing program for homeless families, linking the residents of a housing development with education and employment services that help them work towards self-sufficiency. These communities demonstrated that thinking creatively when looking for partners can add value to their service interventions. The Charitable Assistance to Communitys Homeless (CATCH) Program in Boise, ID: The CATCH program is a public-private partnership that re-houses homeless families and supports them with six months of rental assistance and intensive case management, focusing on linking families to employment, income supports and other services. The program is operated by the City of Boises Department of Community Planning and involves a group of local faith-based organizations and private businesses that provide rental assistance funding, program volunteers, and material resources. The city funds the administrative and operating costs of the program, and the United Way funds the social workers who provide case management to families. Rental assistance, volunteers to help families move into housing, donated goods and furnishings, and community awareness campaigns are provided by faith-based organizations and businesses that commit to sponsoring a family for six months. The DeKalb KidsHome Collaborative in Decatur, GA. The Dekalb KidsHome Collaborative addresses the rising needs of families that are homeless and have children enrolled in the DeKalb County School District. The Collaborative offers education, housing, and employment services to homeless families, with the goals of helping families secure housing and income stability and helping children achieve stable school attendance and performance. The DeKalb County Schools homeless liaison provides services that help maintain student attendance such as enrollment assistance, bus tokens and transportation, as well as services that support school performance such as dental, hearing, and vision care and tutoring. The liaison also offers financial assistance for school supplies and extracurricular activities, such as uniforms, instrument rental fees, and summer enrichment camp. In addition, the homeless liaison helps connect students families to resources that will help them find housing assistance or other services they might need to stabilize their lives. 4. Programs forged strong relationships between case managers, housing specialists, and landlords as a strategy for increasing housing options and promoting housing stability. Among the most difficult challenges confronted by programs in the study were the paucity of decent affordable housing for homeless families and the ability of service interventions to promote housing stability among high-needs clients. The most common strategy used by programs to overcome these challenges was to forge mutually beneficial relationships among case managers, housing specialists, and local landlords. Many communities already had well-established relationships between homelessness service providers and landlords prior to the development and implementation of the programs in the study. Program partners in these communities focused on maintaining and expanding the pool of landlords willing to accept homeless families by leveraging these relationships to encourage landlords to participate in new programs and to spread the word to other landlords. In other communities, the network of landlords was less established, and program partners focused on creating outreach strategies to local landlords and developing their lists of available housing options. In both cases, the local public housing agency often played an important role by supplying programs with its HCV landlord lists and offering its housing expertise. The relationships among case managers, housing specialists, and local landlords were designed to be mutually beneficial: case managers and housing specialists representing programs were able to place homeless families into decent affordable housing; and landlords were reassured by the ongoing program support offered to tenants and by the promise of a stable source of rent (i.e., the housing subsidy). From the perspective of case managers and housing specialists, a common activity was to teach tenants how to interact positively with landlords, maintain the units, and develop their rental histories. Housing specialists also taught families about their tenant rights. These efforts were designed to promote families housing stability, although disputes between landlords and tenants were not uncommon. Case managers and housing specialists encouraged regular communication between tenants and landlords to resolve tenancy issues, but they also intervened as needed to mediate disputes. Indeed, in some communities, landlords preferred to contact case managers who had an established rapport with tenants, understood their housing barriers, and could intervene more effectively than the landlord. The responsiveness of case managers and housing specialists to the concerns of both tenants and landlords appeared to be a critical component of communities housing placement and stability strategy. Adopt-A-Family (AAF) Rapid Re-Housing Program in Palm Beach, FL. The AAF program is designed to address the burgeoning use of hotel/motel vouchers as overflow units for emergency shelters, and the program set the ambitious goal of rehousing families within 30 days of becoming homeless. To meet this goal, case managers, housing specialists, and landlords work collaboratively to quickly screen, enroll, assess, and place families into housing. After program participants complete an application packet with the support of program staff, case managers use the information to help families identify where they want to live, what kind of housing is appropriate, and how much they can be expected to pay for rent once they leave the program. A housing specialist coordinates with the case manager and helps families identify housing that meets their needs and lifestyle. The specialist provides a list of landlords who are willing to accept program participants (including those with poor credit, eviction, and/or criminal histories) and to sign a rental agreement with AAF. The specialist also conducts an inspection to verify the habitability of the apartment, looking specifically for problems with fire safety, security, electricity, sanitation and whether the space is adequate for the family. While clients sign their own leases with landlords, AAF pays the security deposit and first months rent. Landlords also sign an agreement with AAF that outlines the landlords responsibilities as well as the amount and duration of rental assistance. The Saunders School Apartments in Lawrence, MA. The goal of this program is to provide stable, affordable housing for families through the adaptive re-use and historic restoration of the Saunders School (a public elementary school), while assisting them in achieving self-sufficiency through education and employment services. Peabody Properties Inc., a private housing developer, is the developer and property manager for the project. As the key partner and housing developer, Peabody Properties has taken a lead role in developing partnerships with case managers from COMPASS for Kids, a social service and education collaborative that provides educational and employment training and assistance for homeless parents and children. COMPASS helps parents in Saunders School Apartments access affordable child care, work readiness, employment training, job-search support, educational program, English for Speakers of Other Languages training, and other services designed to support families in this program. The program integrates the roles of case managers and landlords within a single setting. 5. Case managers played a central role in linking human services with housing supports, and the strongest linkages were based on deliberate planning, thorough client assessments, and intensive case management. Programs were intentionally designed to link human services with housing supports, and this link was often established by case managers who served as the focal point for assessing client needs, developing appropriate individual service plans, providing referrals and accompanying clients to service providers, facilitating the placement of clients into housing, conducting routine follow-ups and home visits, and gauging progress on individual service plans. The strongest linkages appeared to be forged when: 1) case managers were intentional about creating them; 2) the linkages were informed by a thorough assessment of client needs; and 3) the involvement of case managers was intensive, meeting purposefully and frequently. While some case managers viewed their role as passive conduits to services, providing service referrals as needed, others saw themselves as active enablers who do what it takes to ensure that clients are applying for and receiving eligible services and housing supports. Some case managers physically accompanied clients to service providers and followed up afterward to ensure that clients were receiving the services. Other case managers helped clients identify appropriate housing and drove clients to view the units. In every case, the efforts of case managers to link services and housing were informed by a detailed assessment of the households needs, typically focusing on their housing, employment and income, independent living skills, legal and criminal background, physical and mental health histories, substance abuse issues, and anticipated barriers to housing. The results of the assessment were often formalized in individual service plans that described a clients goals related to these services, how to achieve them, and by when. For some case managers, identifying and tracking the receipt of services was an intensive process, reinforced by regular meetings to review the service plans, home visits, ongoing communication with service providers, mediation with landlords, and in some cases, monitoring the attendance, behavior, and performance of children through the school district liaison. The Permanent Supportive Housing Program (PSHP) in Washington, DC. The PSHP uses a Housing First model to help high-needs clients become self-sufficient and maintain stable housing through the provision of a housing subsidy, moving assistance, and intensive case management. The program links housing subsidies with supportive services through a partnership between the citys department of human services, the citys housing authority, the Continuum of Care lead agency, and case managers at several social service agencies. Although all partners play important roles in establishing the service-housing linkages, case managers are at the center of the program. Case managers are responsible for: 1) gauging client needs and developing service plans through intensive assessments; 2) enrolling clients in appropriate services, which may occur through either a referral or case managers physically escorting families to appointments; 3) assisting families with finding and moving into their housing by helping them complete a voucher application and taking them to view the available units; 4) completing monthly housing visits with each family to monitor their housing condition; and 5) acting as an intermediary between the families and landlords. By playing these roles, case managers are best positioned to integrate services and housing supports that are appropriate for each family. Family Assertive Community Treatment (FACT) Program in Chicago, IL: The FACT program emphasizes housing as the primary goal, believing that mothers need to be in stable housing situations to stabilize their children and to address their own needs. A critical component of the FACT program is the team approach to coordinating services and housing supports. The FACT team is comprised of six members: a project director, a senior case manager/employment specialist, two youth therapists, a chemical dependency specialist, and a housing resource developer. Each FACT team member (except for the housing resource developer) also serves as a caseworker, serving as the main team contact for families enrolled in the program. The FACT team is supported by a therapeutic psychiatrist. As an integrated unit, the FACT team is involved in all critical stages of the program: 1) reviewing the applications and admitting families into the program; 2) discussing how to properly assist families, including the appropriate level of support and interaction with families; 3) creating treatment plans, including the needs of children in families; 4) compiling the needed documentation to access benefits and housing supports; and 5) providing mental health therapy. The teams housing resource developer coordinates with the team and is responsible for conducting a housing assessment that documents what type of housing families can afford, where they want live, and the general cost of living. 6. The long-term stability of program funds was often uncertain, and programs pursued many different funding models that tapped into a breadth of funding streams. Securing long-term funding was a critical issue among all communities that participated in the study. The uncertainty was particularly acute among homelessness prevention programs that were funded mostly through HUDs Homelessness Prevention and Rapid Re-Housing Program (HPRP)[iv] and among programs that relied heavily on foundation support. Funding uncertainty was reflected in the diverse patchwork of funding streams that communities cobbled together to support their programs. Communities tapped multiple federal programs, including Community Development Block Grants, Emergency Shelter Grants, Federal Emergency Management Agency Food and Shelter Grants, Historic Tax Credits, HOME Investment Partnerships Program, HPRP, HCV, HUD-Veteran Affairs Supportive Housing, Low Income Housing Tax Credits, Medicaid, Neighborhood Stabilization Program, Shelter Plus Care, Supportive Housing Program, TANF, and TANF Emergency Funds. Communities supplemented the federal support with many other funding streams, including: city funds, county property taxes, faith-based organizations, foundations (Bill and Melinda Gates Foundation, Hilton Foundation, Meyer Memorial Trust, McCormick Foundation, Paul G. Allen Family Foundation, and Polk Brothers Foundation), individual donations, private businesses, state general and housing trust funds, United Way, Washington Families Fund, and the YMCA. Most communities had a decentralized funding model in which each organization used its own funding resources to support its participation in the program. Some communities Chicago (IL), Portland (OR) and Yakima (WA) obtained funding from foundations that supported activities across the participating partners. In Minneapolis/St. Paul, a centralized funding apparatus was developed to streamline the funding process and relieve participating organizations from the responsibility of renewing funding. Regardless of the approach, communities were concerned about the long-term sustainability of their funding sources, and several expected to lose their primary source of funding by 2011. In these communities, the most pressing question is: what will happen when the primary funding ends will the program have demonstrated its value to other potential funders? Hearth Connection in Minneapolis/St. Paul, MN. The Hearth Connection program provides permanent supportive housing paired with intensive case management. The program combines funding from federal, state and county sources to provide housing, health services, and case management. The majority of the programs funds come from the state, which established the Long-Term Supportive Services Fund (LTSSF) and sets aside about $10 million every two years to support the LTSSF. The program also uses Medicaid funding to provide case management, made possible by Minnesotas Medicaid waiver that allows for reimbursement of targeted, medically necessary case management. Hearth Connection meets the Medicaid match requirement with funds from the state LTSSF allocation. The program also uses funding from HHS Substance Abuse and Mental Health Services Administration for case management. To pay for rental assistance, the program uses funds from the state housing trust fund and from HUDs Shelter Plus Care and Supportive Housing programs. An innovative feature of the funding model is the centralization of responsibilities within a single entity. Hearth Connection alleviates the burden on partner agencies by assembling and managing these multiple funding streams and then issuing each partner a single allotment of funds to support all program activities. Family Housing Stabilization Program (FHSP) in the State of Maine: The FHSP program is a joint effort between Maines Department of Health and Human Services and the Maine State Housing Authority to stabilize TANF-eligible families at imminent risk of homelessness. FHSP combines two funding sources made available through the American Recovery and Reinvestment Act of 2009: TANF Emergency Funds and HUDs Homelessness Prevention and Rapid Re-Housing Program (HPRP). HPRP funds serve as the 20 percent match needed by states to access the TANF Emergency Funds. With the addition of TANF funds, FHSP is able to augment the services eligible under HPRP (rental assistance, other housing-related services, case management, and prevention services) with other services that are not allowed under HPRP but deemed critical to homeowners at imminent risk of losing their homes (mortgage assistance, assistance in paying back taxes and liens, and home improvements necessary to make the housing habitable). Each of the 13 community-based agencies that receive HPRP funds in Maine receives an additional allotment of TANF Emergency Funds to support the FHSP program. 7. The development of standardized intake and assessment tools and data-sharing systems across partners streamlined program operations, eliminated duplicative assessments, improved service delivery, and provided common metrics for gauging progress. Many programs used standardized client intake and assessment tools to determine program eligibility and assess the needs of homeless families. Several programs mandated their use in an effort to reduce the duplicative work conducted by referring agencies and case managers. The use of these intake forms resulted in several operational efficiencies. The forms ensured that families referred to the program from multiple agencies met all of the programs eligibility criteria before the family was contacted for possible enrollment. This pre-screening allowed program staff to more easily serve their target population and maximize available resources to assist eligible families. Once contacted, families were enrolled more quickly into the program, because the standardized forms required referral agencies to append all necessary documentation. In some programs, the standardized intake process included many of the eligibility criteria used by other mainstream assistance programs such as the HCV program, TANF, and the Supplemental Nutrition Assistance Program (SNAP). The incorporation of these eligibility criteria into the standardized intake forms allowed program staff to link clients to these resources as appropriate. Many programs also implemented standardized client assessment tools. Typically, the assessment tools were first administered shortly after the intake process and then were re-administered by case managers at regular intervals during a familys time in the program. Information from these tools was used to gauge families needs, identify issues that might prevent families from obtaining housing, inform the development of service plans, and properly match services to those needs. When administered throughout a familys stay in the program, the assessment tools provided case managers with information on the familys progress in achieving self-sufficiency. The most commonly used tool was the Arizona Self-Sufficiency Matrix, which measures a familys level of distress along 18 domains based on a five-point scale. Some programs also developed data-sharing systems across agency partners. Data-sharing systems exposed staff across program partners to information that was previously unavailable, giving program staff a more comprehensive picture of a family's issues, needs, and housing options, which in turn resulted in better program decisions. Data-sharing systems, when combined with common assessment tools, allowed program partners to develop common metrics for gauging a family's progress and measuring program outcomes. Several programs entered information on families into their local Homeless Management Information System (HMIS), while others designed homegrown databases that were tailored to the program. For example, the Department of Human Services in Washington, DC developed a homegrown system that contains detailed information about each client and about available housing units in the District. The database allows partners to quickly identify qualified participants, assess their needs, help them search for available housing units, and match families to appropriate units. The Homeless Assistance Rental Program (HARP) in Salt Lake County, UT. The HARP program provides scattered-site affordable housing and case management to individuals and families who are homeless or at risk of homelessness in Salt Lake County. To assess families in the program, case managers are required to complete and update two standardized matrices: 1) a matrix that assesses the familys level of self-sufficiency along 20 domains (income, employment, housing, food, childcare, childrens issues, adult education, legal, health care, life skills, mental health, substance abuse, family relations, mobility, community involvement, safety, parenting skills, contact with children, physical health and support network); and 2) a matrix that focuses more narrowly on housing-related domains such as rent and utility expenses, income, housekeeping issues, landlord and housing authority issues. These instruments must be completed before participants move into housing, weekly for the first month and monthly thereafter. The tools provide a consistent approach to assessing clients and gauging their progress toward self-sufficiency. The Community Wellness Project in Alleghany County, PA. The Community Wellness Project links homeless and formerly homeless families and individuals residing in HUD-funded transitional housing or permanent supportive housing programs with employment, training and social service benefits. The program uses a professional occupational therapist from Duquesne Universitys Occupational Therapy Department, who helps administer the O*NET Interest Profiler, a self-assessment tool developed by the U.S. Department of Labor Employment and Training Administration that helps clients match their interests and skills with particular types of work activities and occupations. The program also has a comprehensive data-capture tool that improves the client application process and allows for data analysis. The data are stored in a secure data warehouse that links client and program-level data from homeless assistance programs, HUD McKinney-Vento housing programs, the states TANF program (EARN), a local Workforce Investment Act One-Stop program, and participating behavioral healthcare programs. The integrated data warehouse has resulted in several important benefits to the program: streamlined application processes for homeless families and individuals, and improved capacity of stakeholders to analyze client-, program-, and system-level outcomes. 1. Programs developed a continuum of housing by using locally-funded housing supports as a gateway to federal supports provided through the PHA. Several programs in the study partnered with their local public housing agency to develop a continuum of housing that provides temporary or transitional housing assistance to homeless families with integrated case management services until the families transitioned to a permanent housing opportunity e.g., HUDs HCV program or public housing developments. The objective of these programs was to stabilize families, link them to supportive services, and address both their short- and long-term housing needs. The programs targeted homeless families or families at high risk of homelessness. Families participating in these programs were referred primarily by non-housing supportive service agencies, although some families also came from local emergency shelter programs. The families were receiving services for issues that may have contributed to their homelessness (or precarious housing situation), including mental health care, addiction services, domestic violence prevention, poor credit, and lack of rental histories. After completing intake and assessment forms, case managers within these agencies identified eligible program participants and connected them with a temporary housing subsidy. The temporary housing assistance was often for two years and structured similar to HUDs HCV program, using the same eligibility criteria, payment agreement, housing quality, rent reasonableness, and fair market rent standards. The temporary housing was funded through state and local sources, often involving the states department of human services. Upon enrollment into the program, families were simultaneously added to the HCV waiting list in their areas. The goal was to channel families into permanent, deeply subsidized housing. These programs appeared to have well-defined processes for accessing housing assistance and supportive services. The procedures for each step in the housing continuum were clearly defined and the roles of partner organizations were transparent. In most cases, it appeared that programs that provide these bridge housing supports that were locally funded had a history of collaborative relationships with the local housing agency and other homeless service providers in the area. Housing authorities were often administering the rental assistance or providing their landlord lists and expertise to the program. The Linkages Program in the State of New Mexico. New Mexicos Linkages Program assists homeless individuals and families with severe mental illness in transitioning into permanent housing by providing individualized case management coupled with a temporary housing subsidy. The housing subsidy functions as a bridge until a permanent subsidy through the HCV program is available and secured. The Linkages Program was able to secure $350,000 in state funding to support the program, with $300,000 designated for rental subsidies and $50,000 for move-in assistance and furnishings. The rental subsidies are passed through a statewide mental health services organization to provide the funding necessary for housing subsidies through three regional housing administrators. The Linkages program is based on a Housing First approach seeking to stabilize program participants in housing quickly, thus allowing them to focus on behavioral health issues that may have contributed to their homelessness. The regional housing administrators and supportive service agencies work with clients to help transition them from state-funded housing supports to the HCV program. All clients in the program are immediately placed on the HCV waiting list, which does not offer special preferences for homeless families. The bridge subsidy is structured like the HCV program and, when the HCV subsidy finally becomes available, the family maintains their same unit while the subsidy source transitions. Having met all the HCV program eligibility and housing standards, this transition is seamless for families. Pathways to Housing Program in Brattleboro, VT. The goal of the Pathways to Housing program is to help homeless households and households at risk of homelessness find and maintain housing by linking up to two years of temporary housing assistance with case management services. Program participants must be sponsored by a social service agency provider that provides intensive case management for the duration of the temporary rental assistance. The Pathways to Housing program is designed to be a program of last resort for specific population groups that have had problems accessing the private housing market due to poor credit, poor or no rental histories, and unstable sources of income. The rental assistance, administered by the Brattleboro Housing Authority, is funded by the Vermont Agency of Human Services General Fund. This temporary housing assistance is structured similar to HUDs HCV Program. Families enrolled in the program are required to participate in case management as a condition of their rental assistance. Funding for the case management assistance is provided by individual service providers participating in the program. Although the duration of the Pathways to Housing program is two years, the average length of stay is 18 months. To increase the chances of a successful transition to permanent housing, participants in the Pathways to Housing program are required to immediately begin searching and applying for subsidized permanent housing programs as soon as they enter the program. Currently, the housing agency does not offer preferences to homeless families, although the HCV waiting list is shorter than those in other communities. Some families exit the program to public housing, others to housing supported by HCV subsidies. 2. Streamlining the PHAs process for leasing private-market housing occurred through the re-tooling of PHA administrative procedures and the use of program partners to conduct activities on behalf of PHAs. Streamlining the PHA lease-up process was a challenging issue confronted by programs that partnered with PHAs. It was also a particularly important step among rapid re-housing and Housing First models that prioritized the quick placement of homeless families into housing. Staff from these programs feared losing their clients in terms of developing a rapport and sometimes physically from a protracted lease-up process that may discourage or disaffect families. A more common strategy was to utilize program partners to conduct activities on behalf of PHAs and thus ease the administrative burden on PHAs. Partner staff, most often case managers, assisted with program application, housing search, and unit inspection activities. Case managers frequently assisted clients through the program application process by helping them complete HCV or public housing applications ahead of the application appointment with the PHA. One program allowed case managers to provide documentation that applicants had been rehabilitated following criminal convictions instead of requiring this information to originate from a third party (e.g., employer, parole officer). Program staff also helped clients search for and select appropriate housing units that would likely pass inspection quickly. Another program had case managers complete housing inspections at regular intervals after lease up. The ongoing housing inspections by case managers provided assurances to the housing agency that units were being maintained by clients, especially those with intensive needs. Using program partners throughout the lease-up process appeared to create efficiencies that significantly shorten the process. The Permanent Supportive Housing Program (PSHP) in Washington, DC. With the support of The Community Partnership (TCP, the Continuum of Care lead agency) and the case managers, the citys housing authority modified the typical, linear lease-up process. In a typical lease-up process, clients flow sequentially through various steps completing the housing application and eligibility determination, conducting the housing search and identifying a suitable unit, conducting the housing inspection and determining rent reasonableness, and signing the lease with several scheduled meetings with the PHA throughout the process. The program in Washington, DC sequences the voucher application process at the same time as the housing inspection. Program participants work with their case manager to select a unit from the list of available units (provided by TCP through a shared database); visit the unit (with the case manager); complete an application while the inspection is conducted; and schedule an appointment with the housing authority. As a result, clients complete the lease-up on the first visit to the PHA rather than during multiple, time-consuming visits. In addition, the housing authority provides greater flexibility in meeting the voucher eligibility requirements, waiving repayment of arrears or fines incurred by applicants who are former public housing or HCV residents (more than five years prior). The housing authority also accepts documentation from case managers that a client with a criminal history has rehabilitated him- or herself, a task typically required of an employer or a probation/parole officer. Altogether, program staff indicate that the revised process reduced lease-up timeframes from several months to several weeks. Bridges to Housing Program in the Metropolitan Portland, Oregon Region. Bridges to Housing is a regional initiative facilitated by Neighborhood Partnerships, a regional nonprofit based in Portland that addresses the housing and economic development needs of low-income people. Bridges to Housing serves high-need homeless families in Multnomah (includes the city of Portland), Washington, and Clackamas Counties in Oregon, and Clark County (includes the city of Vancouver) in Washington. The programs goal is to provide permanent housing and intensive case management services to stabilize families, move them towards greater safety, and improve the well-being of children. Program partners play various roles in coordinating with the local housing authority and in providing housing. In Multnomah County, families are enrolled through four non-profit agencies that are responsible for administering a total of 140 housing units for homeless families: 110 project-based vouchers, 25 public housing units and five tax credit housing units. The vouchers and the housing units are from the Housing Authority of Portland (HAP). The 110 project-based units administered by the agencies are located throughout Multnomah County. Twenty public housing units and five tax-credit housing units are located in one of HAPs HOPE VI mixed-income communities in the city of Portland. The other five public housing units are located in scattered site housing in Portland. Case managers from the non-profit agencies help clients with the housing authority applications and prepare appeals if necessary. 3. Programs created PSH-like environments by integrating intensive case management and services with the Housing Choice Voucher program, allowing mainstream permanent housing subsidies to be used by families with high barriers to housing. A few programs in the study integrated intensive case management services with the HCV program or other form of housing subsidy in a way that simulated Permanent Supportive Housing (PSH). These PSH-like programs allowed communities to target scarce housing resources to families with the greatest needs. These approaches demonstrated that communities can coordinate housing and social services resources to target deeply without tapping into traditional sources of permanent supportive housing such as HUDs Shelter Plus Care program. The programs frequently originated from a community or regional plan to end homelessness, bringing together nonprofit, government, housing agency, and private resources to provide the housing subsidy and services. The housing subsidy was typically a tenant- or project-based voucher, public housing, or tax credit unit. The supportive services component often had two common characteristics: 1) detailed assessments to target the neediest families; and 2) intensive, structured case management. Most programs used standard assessments among all service partners to systematically screen high-needs families for eligibility. The screening tools typically examined indicators such as length and number of times a family has been homeless, employment history, household income, interactions with state mental health systems, domestic violence history, and interactions with child welfare agencies. These details allowed service providers to quantify family need consistently and thereby identify the highest-needs families. The cornerstone of these PSH-like programs was intensive case management that was characterized by a low case manager-to-family ratio and frequent contacts with families. The case manager-to-family ratio was typically very low for example, one case manager to every 10 or 15 families to allow case managers to build relationships with participating families and comprehensively assess their needs. Case managers contacted families at least weekly, and typically more often during a familys first few weeks in the program. Most programs required families to participate in case management and provide it for at least two years, with some extending to three years. The case management typically included several components: 1) a family assessment following intake that addressed the needs of all family members, especially children; 2) a family action plan with specific goals and deadlines; 3) frequent and deliberately scheduled contact with a case manager; 4) determining and maintaining eligibility for additional housing assistance programs; 5) service referrals and linkages to community providers such as mental health services, job training programs, employment opportunities, substance abuse counseling, domestic violence counseling, primary health care, child care assistance, and financial literacy; 6) support and advocacy in working with the judicial system, including child protection services, family courts, drug courts, juvenile detention, and gang courts; and 7) tracking a familys progress through standardized assessment tools. Serving Families and Individuals to End Serious Trouble through Agencies Support (FIESTAS) Program in Yakima County, Washington. The FIESTAS program places high-needs homeless families into two-year, temporary, project-based housing units managed by the Yakima Housing Authority (YHA). After this time, income-eligible families may receive a permanent project-based voucher from YHA that is not time-limited. YHA maintains a separate waiting list for homeless families and has 75 project-based vouchers set aside for these families. The housing assistance is paired with intensive case management provided by three specialized nonprofit, community-based organizations: Yakima Neighborhood Health Services focuses on health care and is a Federally Qualified Health Center; Triumph Treatment Services focuses on alcohol and drug addiction; and the YWCA focuses on domestic violence. Staff use common intake and assessment forms, based on the Arizona Self-Sufficiency Matrix, to help families identify barriers to self-sufficiency and develop action plans. Then, throughout the course of the two years, case managers use the action plans to help families identify strategies to overcome the barriers. Building Changes, the agency that provides funding for case management services, works with the case managers to implement an approach to assisting families based on specific strategies, interventions, and supports that have been tested in other communities. Initially, families are visited as frequently as three times a week. As families become more stable, the frequency of contact declines to once per month. All housing units are inspected weekly by case managers, who are certified to conduct housing inspections. This approach ensures participants are taking care of the unit. Bridges to Housing Program in the Metropolitan Portland, Oregon Region. The program offers permanent housing and intensive case management to families that are chronically homeless. The housing resources vary by county but include project-based and tenant-based vouchers, as well as public housing. Case management is funded through philanthropic organizations. Services are provided to each family for three years to help establish and maintain stability, with a case manager to family ratio of 1:15. A common screening tool, the Bridges to Housing Family Needs Assessment, is used by all case managers to identify whether families are high resource users and eligible for the program. The maximum score on the assessment tool is 25 points, and Bridges to Housing requires at least a total of 10 points for families to be eligible to participate in the program. Bridges to Housing believes that its combination of housing supports and support services provides a less expensive and more effective long-term solution to address chronic homelessness compared to other alternatives such as shelters, motel vouchers, and other temporary, very short-term housing assistance. 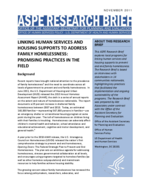 This research brief highlights 10 promising practices used by local programs to link human services with housing supports for the purposes of addressing family homelessness. The practices shaped how these programs were designed, structured, implemented and sustained. They highlight the need to forge intentional, well-defined partnerships with entities (e.g., social service agencies, government departments, public housing agencies, and landlords) that can offer appropriate services to target populations and expand housing opportunities for homeless families, while also looking outside of the traditional social service network for valuable partners (e.g., school district homeless liaisons, housing developers, and private businesses). Indeed, these practices suggest that linking homeless families to services and housing supports requires the active participation of many different community resources, as well as the involvement of a committed group of well-trained case managers. They also reinforce the advantages of standardized processes across participating partners to screen, enroll, and assess clients, which seemed to produce program efficiencies and may have helped to transition clients to permanent sources of housing supports. Lastly, although many communities used one-time funding streams created by the American Recovery and Reinvestment Act of 2009 that will soon expire such as HPRP and TANF Emergency Funds these programs also show considerable diversity in funding sources that can be tapped to sustain them, including the use of mainstream housing programs administered by local public housing agencies. [i] Homeless families are typically defined as households composed of one or more adults with at least one minor child (age 17 or younger) that are staying in shelter or living in places not meant for human habitation (e.g., abandoned buildings, vehicles, or encampments). [ii] For a summary, see Rog, Debra and John Buckner. 2007. Homeless Families and Children. In Toward Understanding Homelessness: The 2007 National Symposium on Homelessness Research. The U.S. Department of Health and Human Services and the U.S. Department of Housing and Urban Development; Washington DC. [iii] Federal funding for homeless families includes programs at HUD, HHS, and the Department of Education explicitly targeted to homeless people in particular, the Homeless Assistance Programs at HUD, the ARRA Homeless Prevention and Rapid-Re-housing (HPRP) program at HUD, the Healthcare for the Homeless program at HHS, and the Education for Homeless Children and Youth program at the Department of Education (DEd). [iv] HUDs HPRP program is a 3-year, $1.5 billion initiative that was passed as part of the American Recovery and Reinvestment Act of 2009. The program is set to expire in 2011.